The Clone Wars are coming to Star Wars: Battlefront 2. The announcement was made at EA’s E3 conference earlier today, and confirmed a series of new planets and heroes will be coming to the game. The Clone Wars content will bring the arrival of a new map based on Geonosis, which fans of the series will recognise from the third act of Star Wars Episode II: Attack of the Clones. That’s admittedly not a great movie, but if you were going to take anything away from it it would probably be the battle scenes that take place on the desert world. You know what might be handy around E3? A great big list of upcoming PC games. It wouldn’t be the Clone Wars without the heroes of that conflict, and EA didn’t disappoint. 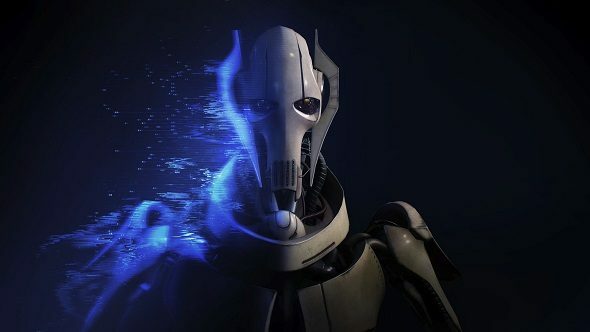 The new expansion will bring four new heroes to the game; General Grievous and Count Dooku will feature for the Separatists, while Obi-Wan Kenobi and Anakin Skywalker will feature for the Republic – let’s just hope he doesn’t get too upset by all the Geonosian sand. You can find out more at the Star Wars Battlefront II EA page. New social elements are also coming to the game to make it easier to play with your friends. There’ll also be a new dogfighting game mode that allows players to use hero ships such as the Millenium Falcon, and a new large-scale multiplayer experience which apparently focuses around attacking and claiming command and taking out capital ships.